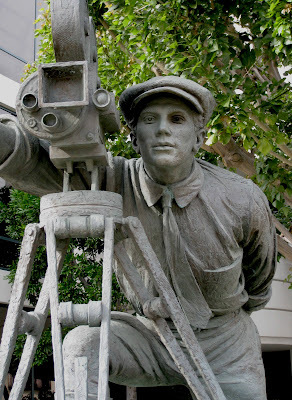 One of my favorite public sculptures in the San Fernando Valley is the heroic-sized statue of the Cameraman on Olive Avenue just across from gate 2 of Warner Brothers studio. Because of flowers planted at its base some of the most dramatic aspects of the work aren’t readily seen, unless one climbs up on the concrete seat that surrounds it. 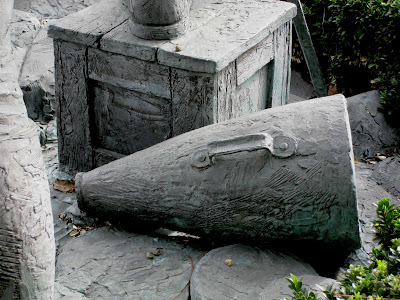 Hard to find are an old time voice powered megaphone..... One can almost here the cameraman’s shout of “All quiet on the set” or “Action”, and an open book with names of those who inspired Andrea Favilli’s exciting career. Graduating from Art Center College of Design 1986, Favilli seems to have movies in his blood. His father is Aldo Favilli, once an art director for Rome’s famous Cinecittà Studios. 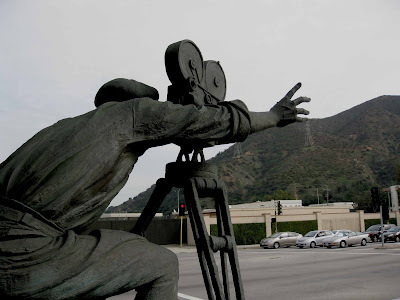 Andrea Favilli’s involvement in the great Dancing Raisins commercial, his design of Disney’s Legends Award, the American Teacher Award and the massive statue of Dr. David Burbank make him a San Fernando Valley treasure. 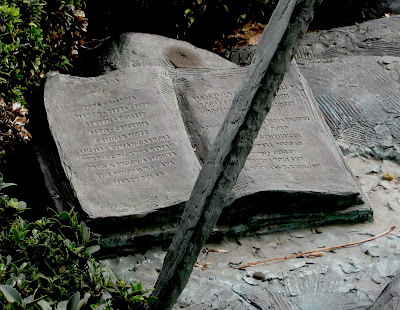 Share the treasures you discover about the San Fernando Valley. Send your photos by jpg format or share hard copies with your Museum. WHERE IS THIS ISLAND PARADISE?